The dog park is a double-gated, fenced, 2-acre area along Bluebonnet Trail, near its intersection with Chisholm Trail in central Plano. The park has benches, picnic tables, water stations for humans and animals, and waste pickup/disposal stations. Please park in the parking lot provided west of the area. You will find the parking lot by traveling one half block north on Pleasant Valley Drive from its intersection with Spring Creek Parkway, west of Custer Road. 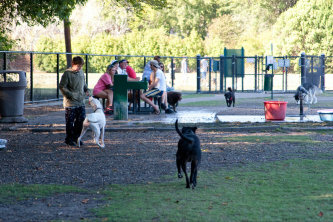 The dog park is the only OFF-LEASH area designated by the Parks and Recreation Department. Then outside the dog park enclosure, all animals are required to be restrained on a maximum 6-foot leash at all times. This includes arriving and departing the dog park. DON’T bring food or drink for yourself or your dog, other than water if desired. Dog park hours are sunrise to sunset daily (unless closed for maintenance or weather).